Rome - the Eternal City! 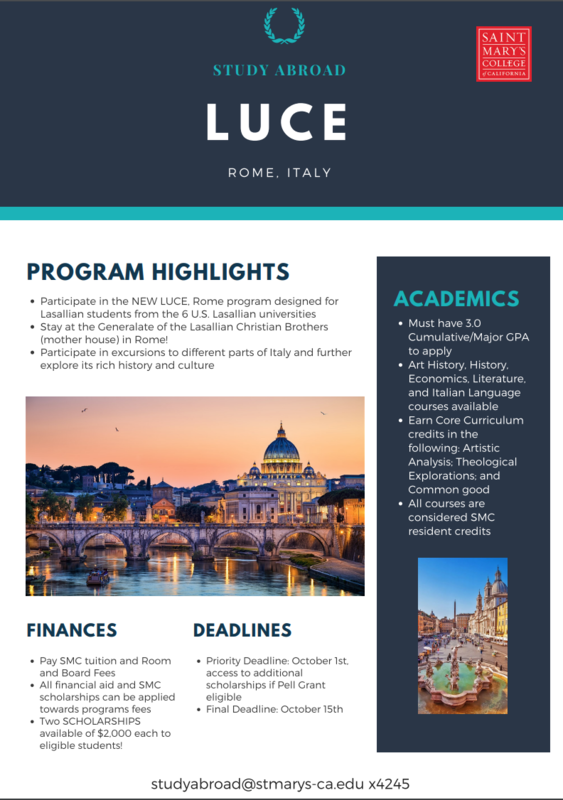 This semester length program gives students from Lasallian universities the opportunity to study and live together at the Lasallian Universities Center for Education (LUCE) in the Generalate in Rome-the mother house for the Lasallian Christian Brothers. Created by the US Lasallian universities, this exciting new program provides students the chance to have a deeper understanding of John Baptiste de La Salle and the Lasallian Christian Brothers while completing major, minor, and general education requirements at their home institutions. Two professors-one from Manhattan College and one from Lewis University-will lead the program, living at the Generalate with the students, teaching courses, and travelling with the students on program sponsored excursions. To find out more and to APPLY - CLICK HERE.